FirstWorks is proud to partner with Mayor Jorge O. Elorza and the City of Providence’s Department of Art, Culture + Tourism on Providence’s signature arts festival – PVDFest – June 6-9, 2019. 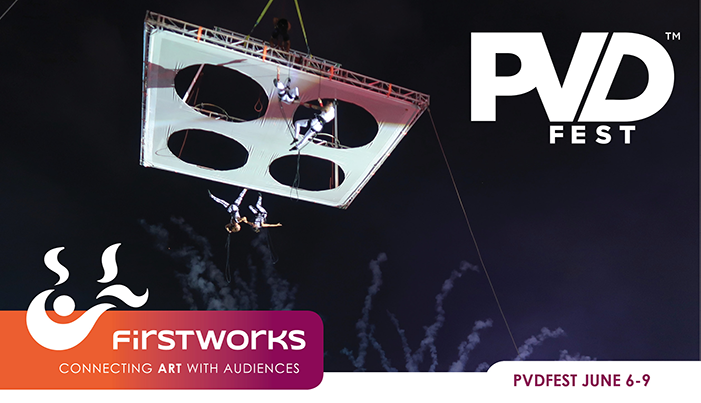 For five years of PVDFest, FirstWorks has curated astonishing performances and spectacles from around the globe, helping to light up the streets of Providence along with hundreds of our amazing local artists, curators, food vendors and community organizations. This year we are thrilled to bring you vertical dance theater from Italy, L.A.’s sensational all-female tapsquad, Haiti’s ambassador of hip hop, Gambia’s first female Kora virtuoso, and songs of hope and peace from Uganda!